Wake up and dream: Science evolving to art? Great advances in science come from creative thinking, a creative spirit. Science aims to help us gain a logical understanding of reality, yet isn't reality non-logical? Art may be proven to be a better expression of reality, or a greater sum of human experience. A recent article in SEED Magazine called "The Future of Science....Art?" opens the question. "This world of human experience is the world of the arts. The novelist and the painter and the poet embrace those ephemeral aspects of the mind that cannot be reduced, or dissected, or translated into the activity of an acronym. They strive to capture life as it's lived. As Virginia Woolf put it, the task of the novelist is to "examine for a moment an ordinary mind on an ordinary day...[tracing] the pattern, however disconnected and incoherent in appearance, which each sight or incident scores upon the consciousness." She tried to describe the mind from the inside." Just by observing our experience of reality, with the many states that we experience daily one can see that looking at the world through "empirical" and "logical" lens into "objective" realm of what is "provable" captures only part of the picture. Reality encompases that which is beyond science as we know it, or at least beyond what the current scientific mindset can currently explain. Lehrer touches on the realm of physics, which is a realm which is definitely beyond the logical. "But the surreal nature of physics is precisely why it needs the help of artists. The science has progressed beyond our ability to understand it, at least in any literal sense. As Richard Feynman put it, "Our imagination is stretched to the utmost, not, as in fiction, to imagine things which are not really there, but just to comprehend those things which are there." It's a brute fact of psychology that the human mind cannot comprehend the double-digit dimensions of string theory, or the possibility of parallel universes. Our mind evolved in a simplified world, where matter is certain, time flows forward and there are only three dimensions. When we venture beyond these innate intuitions, we are forced to resort to metaphor. This is the irony of modern physics: It seeks reality in its most fundamental form, and yet we are utterly incapable of comprehending these fundaments beyond the math we use to represent them. The only way to know the universe is through analogy." Yes, metaphor, art and the non-logical expressions are perhaps the best way to convey the subtleties of reality which cannot be understood "literally." 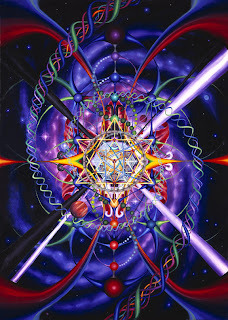 Carey Thompson is a very talented visionary artist who attempts to express realms that science touches with some of his pieces. He writes about his piece "Omnicentricity" - shown above. Carey's comments and artwork point to an understanding of reality that comes through non-logical modes of perception. "Recent discoveries in quantum and astrophysics have completely destroyed the Newtonian/Cartesian notion of ourselves floating around in a fixed three-dimensional space. Astronomers had even thought they had pinpointed the exact center where the infamous Big Bang supposedly occurred. Our universe is multidimensional, its center being everywhere, with all of its manifestations containing within them everything else just as every pixel of a hologram contains within it the image of the completed whole. Thus, modern science is a approaching the conclusion, which ancient peoples had intuitively understood, that all is one in this vast unfolding singularity. The image before you attempts to convey this idea." Leher continues in his article "The fundamental point is that modern science has made little progress toward any unified understanding of everything. Our unknowns have not dramatically receded. In many instances, the opposite has happened, so that our most fundamental sciences are bracketed by utter mystery. It's not that we don't have all the answers. It's that we don't even know the question." "This is particularly true for our most fundamental sciences, like physics and neuroscience. Physicists study the fabric of reality, the invisible laws and particles that define the material world. Neuroscientists study our perceptions of this world; they dissect the brain in order to understand the human animal. Together, these two sciences seek to solve the most ancient and epic of unknowns: What is everything? And who are we?" "Abstract art lets us comprehend, at least a little bit, the incomprehensible." In his new book, "The Science of Leonardo" , Fritjof Capra writes "Leonardo's [da Vinci] approach to scientific knowledge was visual. It was the approach of a painter. 'Painting,' he declared, "embraces within itself all the formes of nature.' This statement is the key to understanding Leonardo's science." If science expresses its discoveries with non-logical aspects of consciousness and may be able to evolve to a more artistic form, to convey a more comprehensive view of the reality it aims to grasp. Leher implies that the scientific mind are unable to completely grasp understand the realms of where science goes. True. We're not. Modern science is born out of the fact that our current thinking process cannot fully understand reality. Yet it is not only the expression of scientific understanding which needs to evolve, but the perception of the scientific mind itself. It is the "literal" subject, the very scientific mind itself which needs to be questioned, and expanded, or more specifically the consciousness of the scientist. Naturally, this is the fabric of many contemplative spiritual traditions - to expand the practioner's experience of oneself from limited to universal. It's not the method of scientific expression, or thinking which holds the greatest limitation, it is the mind of science which needs to be questioned. Deepak Chopra recently stated "All suffering that we have caused on this planet has been caused because we don't understand who we are...."
It is the very nature of who we perceive ourselves to be, and the corresponding capacities for perception, or lack thereof, which are the very realms to be expanded. Perhaps we should fill scientific laboratories with consciousness expanding facilities like meditation rooms, art studios, yoga, floatation tanks? Or rather include disciplines of meditation, cognitive science, parapsychology, healing arts and spirituality in every scientific curriculum. Schools can encourage non-logical days, art expressions, meditation courses. Then we'd have culture of psycho-spiritual-art-scientists. Sounds like burning man... didn't someone say that Burning Man is the incubator of the new planetary civilization?